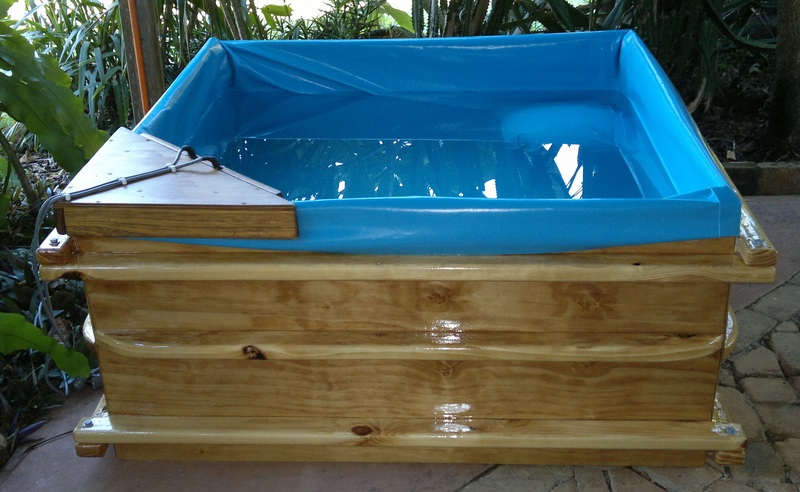 Birth Afloat’s Heated Wooden Birth Pool Kit – Soft, private, strong and sturdy. Complete with all accessories to set up, fill, empty and transport, with ease and simplicity. Ideal for Midwives, Doulas and Birth Centres. Luxurious and convenient. 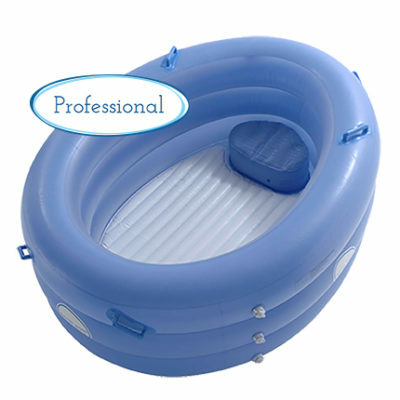 Our Heated Wooden Birth Pool Kits are the only portable, heated birth pools for hire and sale in Australia. They can be purchased as a package here or provided for Hire within designated areas. For interest regarding the possibility of ‘Hire’ in your area, please contact us via email at info@birthafloat.com . We endevour to make water birth easily accessible to all women everywhere. Talk to us about how we can make it possible for you or your clients. 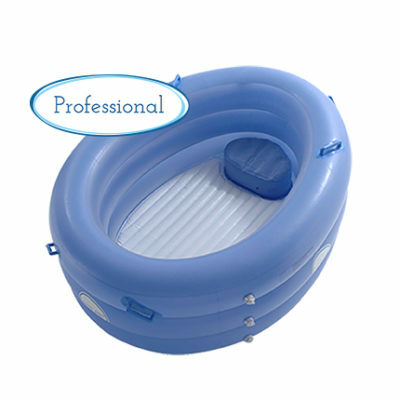 Our Heated Birth Pool Kits come complete with a reusable PVC liner that is guaranteed for 100 births but will last for many more. The Heated Pools are soft and padded with a comfortable seat in the corner, perfect to meet and greet the new bub, a complete hose system which includes a clean fill hose with attachments and a water powered siphon system with all connections, plus all the accessories you’ll need for a smooth water birth journey. Our heating unit completely takes over the job of heating and maintaining the water’s temperature, even for very long labours. thus saving water, time and energy. Leaving the birth partners and attendants to focus on the birthing mother. Ideal for Midwives, Doulas and Birth Centres Australia wide. They’re small enough to be conveniently transported in most cars, but big enough to accommodate a birthing mother and partner. They come as easy to assemble components with clear instructions and can be set up quickly and efficiently for a luxurious water birth experience. Hand crafted Wooden Pool with padded inner sides. 1200mm x 1200mm square, 600 mm deep. PVC Liner – Extremely durable and robust in a calming blue colour. in protective wooden carry case. Floor and rim padding for ultra comfort. 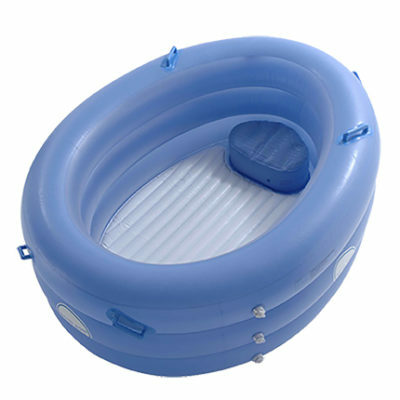 Inflatable seat and electric pump. 10 metre Clean fill hose with adjustable nozzle. 11 metre Water powered siphon system with 10 metre water hose – siphons 600 litres in 10 minutes. Various common tap connections, bushing thread & hose to hose joiner. 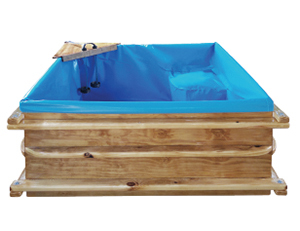 We offer full support and excellent after sales service with your Wooden Birth Pool Kit. As Pools are made to order, there is a 4 week lead time on average for their manufacture and dispatch. Also available upon request is a custom built cleaning frame for the liner. Please feel free to ring us if you have any inquiries regarding this item. Freight costs will be calculated on request with address provided.